In baking, leavening is the air that causes breads, cakes and other baked goodies to rise when they go in the oven. That air (or gas, really) is produced in different ways, depending on what type of leavening agent you use. This in turn varies according to what you're baking. But the simplest way to think of it is that the leavening agent produces the gas, and the gas causes the dough or batter to rise. There are three main types of leavening agents: biological, chemical and steam. Dough is made of wheat flour, which contains a pair of proteins called gliadin and glutenin. When you add water and start to mix it, the gliadin and glutenin combine to form a new protein called gluten. Gluten molecules arrange themselves into chains that can be quite long and elastic. This elasticity is why you can take a piece of bread dough and stretch it between your fingers. 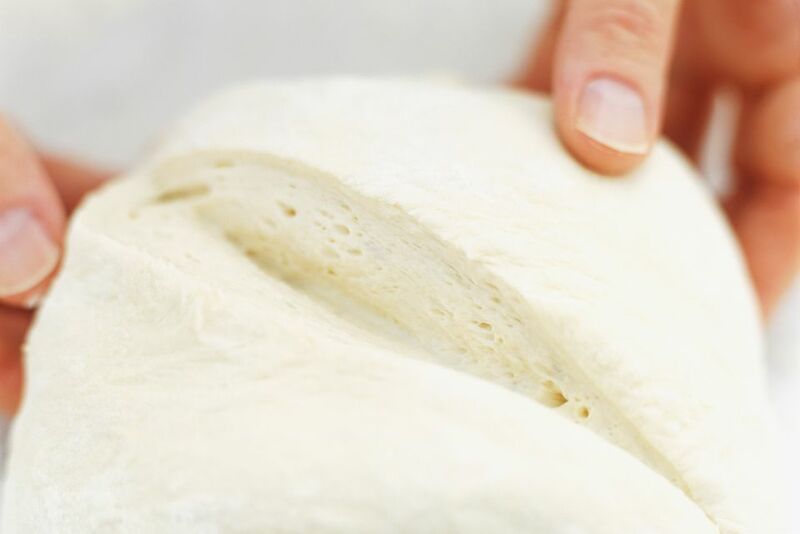 The more you knead it, the stretchier it gets. Next the gas produced by the leavening agent forms thousands of little bubbles in the dough, which causes it to inflate. Imagine thousands of little balloons being blown up with air. Dough is stretchy, just like balloons. If it weren't, rather than blowing up a balloon, it would be like blowing into a glass of water with a straw. The bubbles would immediately burst and the gas would escape. Due to the dough's elasticity, the bubbles expand without bursting, so the gas remains trapped in the bubbles long enough for the third part of the reaction to take place. Lastly, the heat of the oven cooks the dough, causing it to set while those little bubbles are in their inflated state. So, once the gas finally escapes, those air pockets hold their shape instead of deflating. The size of those air pockets determines the texture of your baked good. Small air pockets produce a smooth texture, like with a cake. Larger ones produce a coarser texture, like with a crusty bread. Yeast is composed of single-celled organisms (a type of fungus) that undergo an existence far removed from anything you or I would recognize as "life," yet they perform a vital function. Yeast is responsible for the process of fermentation, without which there would be no such things as beer, wine or bread. How fermentation works is yeast eats sugar and they produce carbon dioxide (CO2) gas and alcohol. The alcohol is a boon for winemakers and brewers, and the CO2 comes in handy for bakers. CO2 also produces the bubbles in beer. Active dry yeast is what most recipes call for. It's a dry, granular yeast sold in packets or jars. Before working with it, active dry yeast must be activated, or "proofed," by dissolving it in warm water. The ideal temperature is 105 F. Cooler than that and the yeast won't fully activate; too much hotter and you'll kill the yeast before it can do anything. Instant dry yeast is also a granular yeast sold in packets or jars. Unlike active dry yeast, however, instant dry can be mixed directly in with your flour, no proofing required. Moreover, you only need to use 1/3 to 1/2 as much instant dry yeast as compared with active dry. Fresh yeast is found mainly in commercial bake shops. It comes in one-pound bricks and can be added directly to the dough or dissolved in water first. Note that dissolving it is only to help disperse it more fully; it doesn't need to proof. You can convert fresh yeast to active dry or instant dry by multiplying by 0.5 and 0.35, respectively. As a general rule, it's best to use whatever type of yeast a given recipe calls for. There are too many variables that can come into play when you start converting. In most cases, yeast doughs rise once, get punched down and then rise again. Finally, they go into the oven, where the heat rouses the yeast to one last great expulsion of CO2 before they reach 140 F and die. Unlike the next two leavening agents, yeast contributes flavor as well. Indeed, adding more yeast to a recipe won't cause the bread to rise more, but it will produce a more intense yeast flavor. Baking soda (sometimes called sodium bicarbonate or bicarbonate of soda) is a white powder that comes in a box, and it has a pH level of 8 to 9, which means it is a base. When combined with an acidic ingredient, it will produce a chemical reaction that causes the release of CO2. Unlike the reaction of yeast, which occurs slowly over a long period of time, baking soda acts quickly, which is why the breads and muffins it produces are called quick breads. Some examples of acidic ingredients that will activate baking soda are buttermilk, lemon juice, yogurt, sour cream, molasses or honey. In its dry state, baking soda is inert but once activated, it reacts immediately. Baking powder is a product consisting of baking soda plus some other acidic component, also in powder form. As long as it stays dry, it's inactive. Once moistened, the chemical reaction begins. It's less immediate than a straight baking soda reaction, however. Unlike baking soda, baking powder is double-acting, which means it begins working when mixed and then gives off another burst of gas when heated. That's why some quick bread batters, like pancakes, can be held for a while without them losing their potency. One thing that can't be said enough, however, is that you cannot substitute baking soda for baking powder or vice-versa, as it won't work. Unlike the leavening agents above — all of which produce CO2 gas — steam is simply water vapor, produced when the water in your dough reaches 212 F and vaporizes. Boring old steam may seem anticlimactic when compared with the exotic and mysterious processes described above, but steam is a powerful force. When water becomes steam, its volume increases by some 1,500 times. The force with which this expansion takes place is increased by higher temperatures. Puff pastry and choux pastry are two examples of pastry that use only steam as their leavening agent, yet when prepared properly are superbly airy and flaky. The key is to ensure that the dough captures the steam. With puff pastry, this is done by incorporating butter into the dough and then rolling it into book folds. This technique produces hundreds of layers, which puff out into separate flaky layers as a result of the steam produced by the liquid in the dough and the water in the butter. Choux pastry, which is used for making cream puffs, eclairs and beignets, uses a different technique. By cooking the dough once on the stovetop, the glutens are partially denatured, which reduces the dough's elasticity. Meanwhile, the starch in the flour is gelatinized, which helps give it structure. Thus when it's baked, the steam inflates the pastry but rather than snapping back, it holds its shape and the air pockets in the center of the pastry remain intact.